Two of the world’s largest internet companies, Google and Facebook, are fighting for internet supremacy in Indian villages. On Dec. 16, Google CEO Sundar Pichai—on his first overseas visit as the new head of the search giant—addressed a packed ballroom in Delhi. Dressed in a casual grey shirt and jeans, the Indian Institute of Technology graduate spoke about how India is going to be central to Google’s expansion plans in the coming years. “Over the next three years, we plan to help more than 300,000 villages across India go online,” Pichai told a gathering of hundreds of journalists and developers in New Delhi. With this rural push, Google is now on the battlefront with another internet giant, Facebook, to tap one of the largest internet user bases in the world. These firms are fighting it out to increase their usage—and, in turn, revenue—as Asia’s third largest economy offers them unprecedented opportunities. “Companies want to improve their top line (revenue) and to drive this growth, new markets will be the key. If you want to have 30-40% growth, then markets like India give you the opportunity to do that,” Ravi Gururaj, chairman of India’s software industry body Nasscom’s product council, told Quartz. 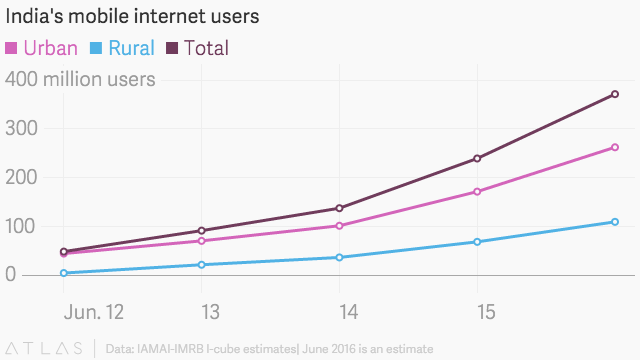 India is forecast to have 426 million users online by June 2016, making it the second biggest in the world, even beating the US. And this despite the internet penetration in the country of 1.2 billion being less than 20%. In the past year, several global tech moguls have tried to woo Indian users—and the government. Both Facebook’s Mark Zuckerberg and Microsoft CEO Satya Nadella have visited India and met prime minister Narendra Modi to discuss their ambitions and plans. Zuckerberg has met Modi twice and also hosted him at Facebook headquarters in Silicon Valley earlier this year. Pichai himself is also likely to meet Modi during this trip to India. The two had last met in September during Modi’s visit to Silicon Valley. At the event, Pichai reiterated several of Google’s plans for rural India: Android keyboards in 11 languages and Wi-Fi across 100 railway stations in India by 2016—a nod to the growth of mobile-first internet users in the country. Google will also launch a “tap to translate” program soon. Under this feature, a user will be able to translate an image or text to their own native language even without internet access. The scheme is likely to be rolled out next year. In addition, Google is currently working with the government to roll out its ambitious balloon program, named Google Loon, which forms a large communication network using balloons in the earth’s stratosphere. This is specifically to provide connectivity in rural villages. But Google is not going to have it easy in India, given Zuckerberg’s aggressive push for internet.org, a free, limited internet for the subscribers of Reliance Communications. Facebook has already established itself as “the internet” in several other parts of the world, and rural India may not be an opportunity that Google wants to miss on—considering the sheer number of Indians that are expected to use the internet for the first time in the coming years. While a Facebook spokesperson told Quartz that the social media giant isn’t competing with anyone, and merely wants to help billions of people come online, net neutrality activists say that the service violates the spirit of an open internet. With internet.org, Facebook is “desperately trying to make the poor of India into a market segment which does not use Google,” says Mahesh Murthy, co-founder of Mumbai-based venture capital firm Seedfund. Like Google, Facebook has also been investing to localize for India. The social network is already available in 11 Indian languages, according to its website. These include Hindi, Gujarati, Tamil, Malayalam, Kannada, Punjabi, Bengali, and Marathi, among others. Facebook also has atranslation application for improving existing translations into regional Indian languages or help the network translate to other languages.